The handrails and posts on the playground equipment contain high levels of lead paint. Authorized SportsPlay dealers nationwide from January 2003 through December 2007 for between $1,300 and $5,500. 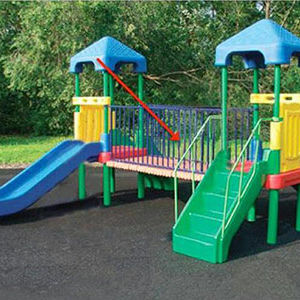 Stop using the playground immediately if the painted parts have chipped off. Consumers with the recalled playgrounds have been directly contacted regarding this recall and will receive free replacement parts. For more information, contact SportsPlay at (800) 727-8180 between 9 a.m. and 5 p.m. ET Monday through Friday, email customerservice@sportsplayinc.com or visit www.sportsplayinc.com.